We’ve mentioned several times that Spalding is the leading manufacturer of basketballs and basketball hoops. For several decades they’ve made the official basketball of the NBA. This is a testament to the quality of the products that Spalding produces. One of the more popular portable basketball hoop models from Spalding is the Spalding 60 Inch Portable Basketball System. The Spalding 60 Inch finds itself in between the cheaper Spalding Pro Slam and top of the line Spalding Beast in terms of price, quality, and features. Featured on the Spalding 60 Inch Portable Basketball System is a 60 inch acrylic backboard. Backboards made of acrylic are generally in the mid-tier in terms of performance. As an owner of a Spalding hoop with an acrylic backboard I can assure you that the performance of the acrylic backboard found on the Spalding 60 Inch will satisfy the vast majority of players. That said, if you are set on having a backboard that performs like the backboards in your local gym, then you’ll want to dig deeper into your wallet and shell out the cash for a basketball hoop with a high quality tempered glass backboard. I’ve had first experience assembling a similar Spalding hoop and I can say without hesitation that you will need two people to assemble the Spalding 60 Inch Portable Basketball Hoop. For most people assembling this hoop expect to commit around 3-4 hours to put the Spalding 60 Inch Basketball Hoop together. Pay particular attention to lining up and assembling the three piece support pole as you only get one chance to get this right. Otherwise, your hoop will turn out off center. 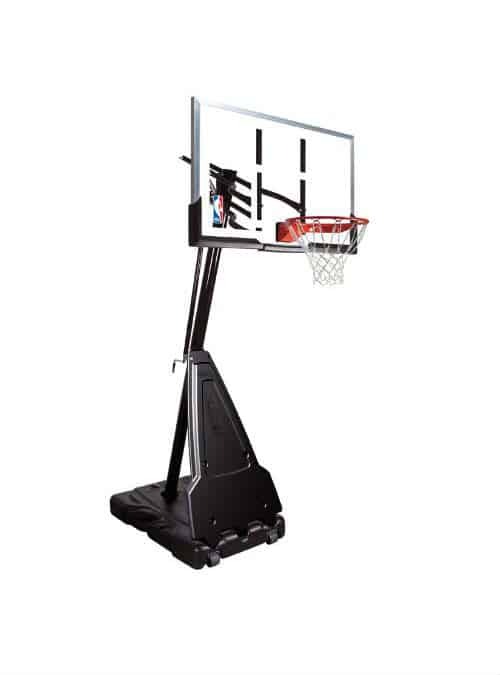 A three piece support pole is included on the Spalding 60 Inch Portable Basketball Hoop. This three piece support pole has a 3.5 inch diameter. Three piece poles are found on the vast majority of portable basketball hoops and do lend to some slight vibrations. However, the extra vibration on the Spalding 60 Inch is certainly tolerable. Again, if you want a higher quality support pole with your portable basketball system then take a closer look at the Spalding Beast, which has a square two-piece support pole that is more robust than the one found on the Spalding 60 Inch Portable Basketball Hoop. Spalding’s Aren Slam breakaway rim is a quality rig that utilizes a heavy-duty spring to stabilize the rim and connect the rim to the backboard. Having a spring loaded rim comes with pros and cons. The pros is that the hoop is less likely to snap or break abruptly when dunked on. Good quality breakaway rims also provide a feel more consistent with the breakaway rims in your local gym. Still there is a primary con to breakaway rims to be aware of. Over time spring-loaded rims can begin to sag if they are abused or dunked are regularly. For this reason we do not recommend dunking on the Spalding 60 Inch Portable Basketball System. If your rim does begin to sag consider buying a new spring that will fit the hoop as long as the rest of the rim is in good condition. The Spalding 60 Inch Portable Basketball System comes with a 40 gallon fill base. This is a solid base size and is only exceeded by the Spalding Beast in terms of size. We recommend you fill this base with water and add some antifreeze so that the water will not freeze during colder months. Hoops similar to the Spalding 60 Inch Portable Basketball System include the Spalding Beast and the Spalding Hybrid Basketball System.